45 Boulevard Des Batignolles, 44300 Nantes, Frankrijk. 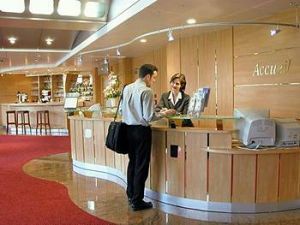 Brid Hotel Amandine is strategically located right in front of the Stade de la Beaujoire stadium, in Nantes, approximately 15 minutes driving distance from Nantes city centre. Easily reachable by public transportation, this welcoming accommodation in Nantes is the ideal place for tourists wishing to discover the magnificent Château des Ducs De Bretagne castle and its famous museum, or to enjoy a boat trip on the banks of the Erdre river. It is situated within walking distance of the Parc des Expositions fairgrounds. On-site hotel amenities also include a bar, a restaurant and a complimentary parking area. This hotel provides 63 elegant and soundproofed guest rooms, each featuring a private bathroom with hair dryer. Room amenities also include wireless Internet connection, satellite TV, telephone and writing desk. Voor oudere kinderen en volwassenen wordt 8.50 € per extra bed aangerekend. Mastercard, American Express, Carte Bleue.